Faistenau is a village in the Flachgau area of Salzburg, on the verge of the Salzkammergut. Faistenau is situated some 30 kilometres east of Salzburg city, within the Osterhorngruppe mountain range. 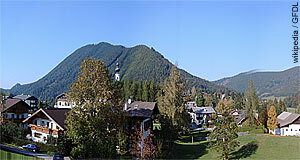 The mountains make Faistenau less accessible from the capital than for example the villages north of Salzburg, it is therefore no commuter′s town like many other communities in the province. Faistenau was first mentioned in the 12th century, relatively late for this area - again a hint towards its relative inaccessibility from the main trade routes. Today, Faistenau is locally known as a skiing area. The community benefits from the vicinity to the northern Flachgau area and parts of Upper Austria, economically well-developed parts of Austria with a high population density. From this area, the skiing resort of Gaißau-Hintersee is not far, in fact, the closest ski resort as such from most of this area. Gaißau-Hintersee is a relatively tame and unexciting array of slopes, but known as an "inside" tip that is less touristy and thus a great deal cheaper than the skiing areas of the Pongau or Pinzgau (not to mention Tyrol or Vorarlberg). Since skiing alone won′t keep an economy going all year round (except for glacial areas where summer skiing is possible), Faistenau is trying hard to diversify its recreational offerings. This has been done for years, with varying success: Today, Faistenau is certainly a good place for hiking, mountain biking and water sports at lake Hintersee. The problem with the latter is mainly that many other lakes of the Salzkammergut are a great deal more attractive. Another swimming option is the Felsenbad Faistenau, one of only three river lidos in Austria. The best argument for Faistenau, however, is the value-for-money ratio - which is rather good, thanks to the almost complete absence of international tourists (except for Germans, but they are everywhere).